In the text, the is a link to the definition of the word it marks. Siege Lines around Petersburg. Note that "North" is to the left. The Crater, as it appeared in 1865. The Crater - January, 1998. 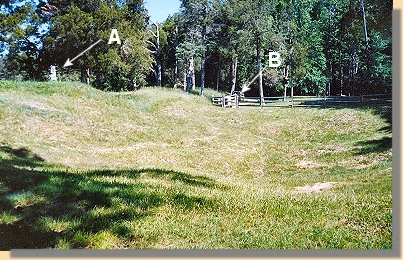 The grass covered mounds (enclosed by a wooden fence in the photo above) are all that remain in 1998 of the results of the massive 1864 explosion. The Crater, A different View - 2006. A - Mahone Monument (view blocked by trees). B - South Carolina Monument. 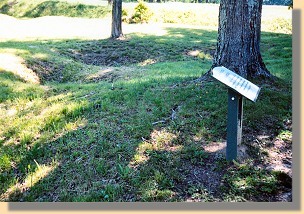 Confederate Countermine Location - 2006. 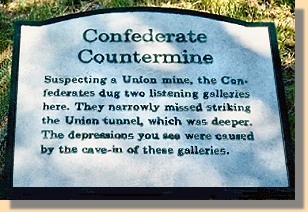 Sign describing the countermine - 2006.